Tigers are the largest type of the cat family. Tiger has a body of grace and a structure of fight that helps them to capture their victims and get themselves out of danger easily. They can grow up to eleven ft. of length and can weigh up to 670 pounds. It’s because of their unique body build up that enables them to attack and kill their prey even those that are much heavier than them. The Female tigers are smaller in stature than male tigers. Another interesting feature of tigers is the stripes that can be found in their body. 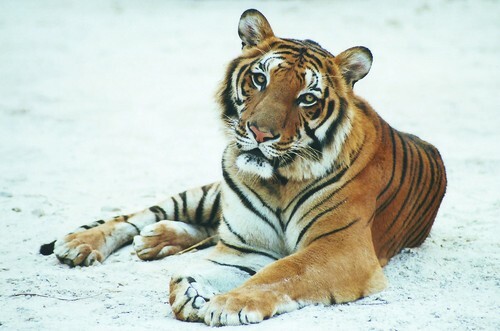 The orangish color designed with white and black stripes makes each species of tiger unique. Just like human being who has his own distinct fingerprint, tigers have their own distinctive pattern of stripes thus, no tiger is alike. The stripes are letting them to mingle in their environment so that they can attack their prey easily. Each tiger species has different color combinations of stripes in their body. White tigers have white body with blue eyes and black stripes. More or less, 30 giant teeth that are razor-like sharp can be found in a tiger’s mouth. Interestingly, all of these teeth can wear out when a tiger gets old. As these teeth gradually wear out, tigers can no longer hunt their prey and mostly die due to starvation. The mighty claws of a tiger are extremely sharp. 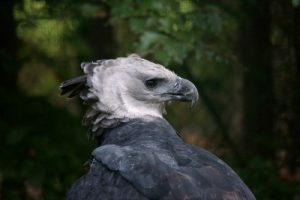 On each foot, they have 5 claws in which one doesn’t touches the ground when they are in a standing position. They also mark their territory in the wild. They are scratching the trees using their claws to show ownership. 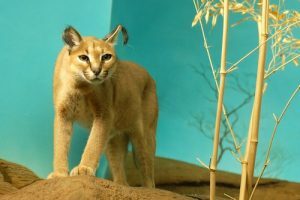 They have a membrane like sheath that thoroughly covers their sharp claws so it won’t get damaged when they are not in use. The paws of the males are larger than those of the females. 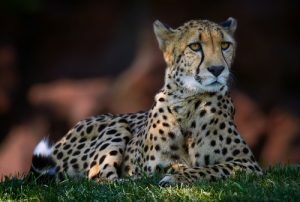 Their legs at the back are somewhat longer than the front which also help them to run fast and give them the capability to jump higher and far to capture their prey. Another great and unique feature that the tiger has is their sense of sight. Like humans, they can see well during daytime, but their abilities are amazingly six times more than what humans can see during the night. This definitely makes much easier and efficient for them to follow up on their victim and kill them. Having large pupils as well as huge lenses give them a terrific look and better night vision than most animals. 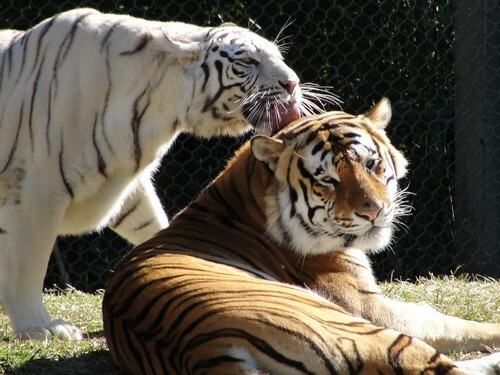 Just like any other animals, tiger have their own ways of communication and sending messages to each other. Some of their communicating ways are similar to that of domestic cats. When they feel threatened and ready to fight they may put out and show their claws with their back arched straight right up. In this way they are showing other tigers their strength and warning them to retreat. 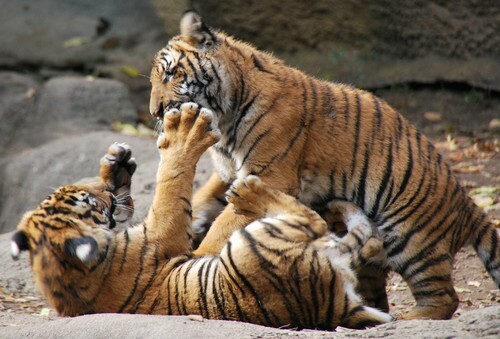 This is the initial posture they make when some other tiger is trying to attack them. The position of the ears, head, paws and teeth indicates the behavior of a tiger. If they are ready to attack, they will show their teeth, heads up high, ears back and paws in place. Contrary to this, their tail held up high if they are only curious about something or other animals in the area. This also means they are on alert but not feeling threatened. The tail has a special scent gland to help them acknowledge each other, they usually rub this gland on their bodies. They also used this in their mating process. In between the tiger’s toes, a gland can be found which let them to leave their signature scents as a mark of their territory. 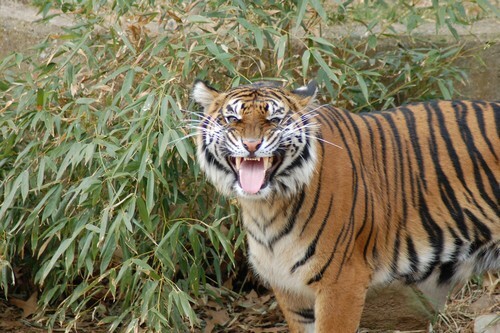 Roaring is a verbal way of communication that tigers use to protect their territory and attract other tigers. It is believed that their roar can be heard up to two miles of distance that can help them to alert other tigers within their territory. There is another type of communication that tigers use, the moaning. It is presumed to be a type of tender and relaxing communication. The mothers often used this type of communication to make their young tigers to follow their rules and supervision and to venture new things. Tigers also use another type of communication which is the snarling, they use it when they sense danger. And again the mother tiger usually uses this type of communication to keep other tigers or animals away from their young ones. Snarling is also used when other tigers are trying to steal some other’s meal. Male tigers may have their kingdom a mighty territory of up to 60 to 100 sq. kms. while females are up to 20 sq. kms, their territories may change according to their habitat and subspecies. Tigers are solitary creatures and independent kind of animal. They usually not seen with other animals unless they are in mating season or unless mother tigers are near their young ones. The area of a tiger’s territory must have suitable shelter, water and a lot of prey. The tigers mark their territories by urine spray or gland secretions on trees which can be smelled by other tigers knowing they have entered their territory. Some male tigers especially Siberian tigers have a thick fur around their head on back side. The thick whiskers of tigers that are usually white in color help them see their way in dark. The color of a tiger’s eye is usually amber. They have extraordinarily good sense of both sight and hearing. The Canine teeth of tigers are 5.5-6.5 cm long that are perfect for tearing apart the flesh of their prey. They are gifted with enormous feet that have 5 toes on fore feet and 4 toes on their hind feet. The tiger’s claws are long and can grow up to 10cm of length. 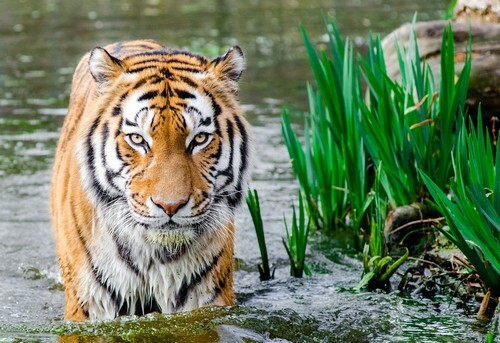 Tigers are very good swimmers and they certainly enjoy swimming in water. Eventhough their size is large, they are created in such a way that they can reach a speed of up to 45-65 km/hr. and can jump 9-10m lengthwise. White tigers are basically a mutation of tiger species that are also known as chinchilla albinistic. They are not a subspecies but a genetic mutation of Bengal Tiger. They have white coat, black stripes, pink nose and blue eyes. There is also a possibility of existence of blue tiger and black tiger but there is no physical evidence to prove this fact. Male tigers may overlap their large territories with female tigers that usually have small territories. The size of tiger territory may vary according to available sources like water, prey and also shelter. Siberian tigers have largest territories among all species of tigers. 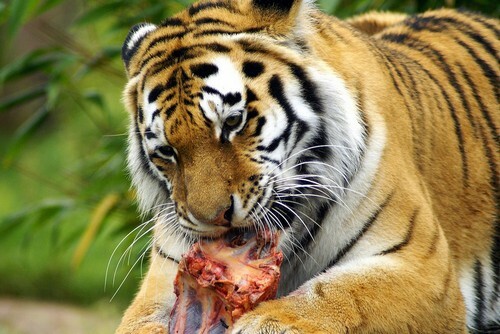 Tigers are carnivorous animals, eating mostly deer and buffaloes. They also attack and feed on chital, roe deer, rusa deer, sika deer, water buffalo or they may hunt birds and monkeys. They can also kill other predators such as leopards and python bears. Usually these predators stay away from them. Tigers may also eat large animals like infant elephants or rhinos. But they avoid attacking adult animals of such as they know that it will be dangerous for them. Tigers are also called cattle-killers as they are notorious for killing domestic animals. Tigers usually use the trick of making their prey fall off-balance by attacking on them and then immediately biting their throat first holding it until the prey dies. The only predator of a tiger is human. They do not attack human in usual circumstances but sometimes when they are threatened by them they will fight back to protect themselves. It’s kind of an instinct. The man-eating tigers are particularly found in India, where they attack human children when they cannot find any other normal prey. They may also attack human when they get old. Unlike lions, tigers do not roar all the time. They only roar when communicating with other tigers that are far-off. During attack, tiger will not roar so that the prey will not get alerted, they usually hiss instead of roaring. If many tigers are feeding on the same prey, the males usually wait until females and cubs have eaten first. 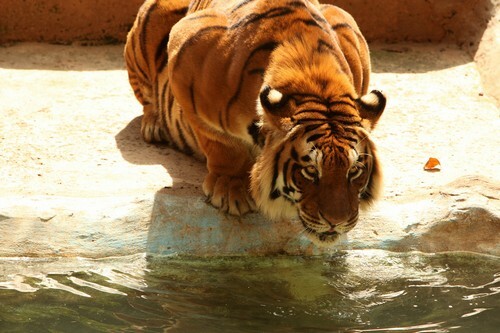 Tigers wait for their turn to eat instead of fighting. Tiger have a cultural status in china. For them tiger is full of life, symbolizes drive and determination to succeed. There are studies that in the last eighty years, three have become extinct out of the nine original subspecies of tigers. 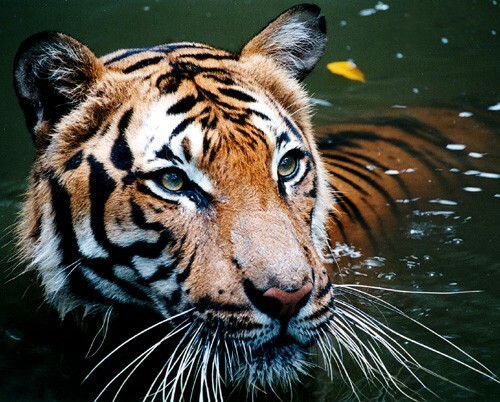 There’s a prediction that all tigers have a possibility to become extinct within the next decade. Some of the reasons of their decrease population are poaching, fragmentation and habitat loss.